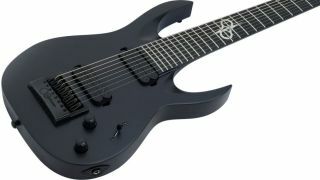 The A1.8C is the up-and-coming brand's first eight-string guitar. Ola Englund's Solar Guitars has unveiled the A1.8C, the company's first eight-string guitar. The A1.8C features an ebony fingerboard, Solar 18: locking tuners, stainless steel frets, two coil-splittable Duncan Solar humbuckers and a 27” scale length. The guitar also comes with a giant Evertune bridge for enhanced tuning stability. The Solar A1.8C will be available in April for $1,299. For more info on the guitar, head on over to solar-guitars.com.